Estwing claw hammer straight 20oz is the ideal nail hammer for woodworkers as it's perfect for striking nails and ripping apart wood that has been nailed together. 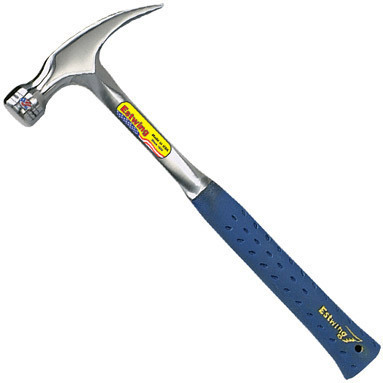 This straight claw hammer is solid forged in one piece of tempered steel to offer maximum strength and increased durability. Estwing's unique nylon vinyl shock reduction grip helps to offer extreme comfort by reducing vibrations caused by impact, which helps to reduce muscle soreness and fatigue. Fully polished head and neck. Made in the USA since 1923.